We’d love your help. 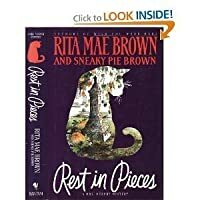 Let us know what’s wrong with this preview of Rest in Pieces by Rita Mae Brown. To ask other readers questions about Rest in Pieces, please sign up. Another reviewer spoke of "sophomore slump"; I call it "second novel syndrome." Many years ago, I read the first Mrs Murphy novel, and then the third, and enjoyed them both. My friend didn't have No. 2, so I was interested to see what came next when I ran across it. I almost wish I hadn't wasted the reading time. So why finish it? you ask. I dunno. Because it was there. Brown was obviously riding the wave the the popularity of the first novel, maybe this one was rushed to press or something Ugh. Another reviewer spoke of "sophomore slump"; I call it "second novel syndrome." Many years ago, I read the first Mrs Murphy novel, and then the third, and enjoyed them both. My friend didn't have No. 2, so I was interested to see what came next when I ran across it. I almost wish I hadn't wasted the reading time. So why finish it? you ask. I dunno. Because it was there. Brown was obviously riding the wave the the popularity of the first novel, maybe this one was rushed to press or something. . The book starts around Halloween time, so I was prepared for things a bit creepier, but Brown streeetches out the inaction until the new year. Brown's ambivalence toward her own plot and characters is far too evident--ghost stories at Christmas? Do make up your mind, girl! The ghost stories themselves are patchy and silly. We are subjected to a cat's version of "Seeing Mary Home" aka The Vanishing Hitchhiker--but since when can a cat, any cat, shut the door? Let alone have a house of her own? And why would a ghost tell someone "I love pink roses"--and then in the next sentence ask them to plant yellow ones? After the nearly courtly manners and attention to social niceties of "Wish You Were Here," suddenly everybody has an odd nickname. I mean, seriously--"Cabby" and "Taxi"? I was disgusted by the amount of profanity Brown felt she needed to use, even among the animals (who are usually sooooo morally superior to the humans that support them.) She has Mrs Murphy using the F-word, and Pewter calling her an A-hole, while the humans, even Harry, turn the air blue at every turn. In the narration itself, the language is clunky, to wit: "The repetition of chores soothed her, like a labor's liturgy." Does she mean "laborious?" The reason it took me so long to read this was that I kept sighing and putting it down in favour of something else. I really, really disliked this book and only finished it because I refused to let it get the better of me. I kept hoping it would redeem itself. It doesn't. I liked that this book's ending was a twist that I was not expecting. Some mystery books solve the mystery in the middle and then spend the rest of the book trying to hunt the bad guy/gal but it's nice to be kept in suspense until the very end. I really do love this series. The characters are great and the banter with the animals is quite amusing. Having cats, it's fun to see what they might be thinking at times. Didn't see the ending coming at all and I loved it! This is book 2 of this series however you DO NOT have to read these in order; but I feel you could understand everyone's relationships better if you at least read the first book in this series as it explains who every one is and who everyone is within the community. I had to skip book 2 and read book 3 and I was a little 'lost' to minor issues that wasn't a big deal in the story. Reading them in order you get to 'know' the characters little quirky things about them but it doesn't spoil the stori This is book 2 of this series however you DO NOT have to read these in order; but I feel you could understand everyone's relationships better if you at least read the first book in this series as it explains who every one is and who everyone is within the community. I had to skip book 2 and read book 3 and I was a little 'lost' to minor issues that wasn't a big deal in the story. Reading them in order you get to 'know' the characters little quirky things about them but it doesn't spoil the stories themselves if you can't read in order. This was a really good mystery. If you enjoy animals-are an animal lover then you will really enjoy how the author(s) incorporated the main characters dog and cat as main characters. The humans talk and work together and so does the animals within the story. When the humans aren't 'doing the job' then the animals kick in and work together to try and solve the crime before their beloved human gets hurt. It's not corney but written in a way that is really nice and not 'child like' at all. This book keeps you wondering 'who did it' or even 'why' right up until the very end of which I like, nothing like figuring out who did it way long before the book was done and then having 'fill in' material for the rest of the story. I can't wait to read more in this series. You get to know and love the people of this small town both two and four legged and anticipate what they will be up to next. This book I really liked since it wasn't a 'suspense' type of murder; but through the story although there was a murder and the community was trying to figure it out. You learn more about the characters and working with one another and caring etc. Also the descriptions of Halloween and Christmas was very nice. I personal listened to this on CD. The reader did a pretty good job at the way she read this to us. Changing her voice when she needed to. But there were sometimes that some of the characters had the same voice so you really had to listen to figure out who was doing the talking at that moment in time. Quite a good one. Good plot and I love the characters! I've read several in the series and I really enjoy them although my hubby didn't like the fact that the animals talk to each other - I kind of enjoy that and it moves the plot along! I think they are really fun cozy mysteries and I will continue on til I finish the series. I also like her other books. Now that I know where the "cozy mystery" section is, I had a much easier time locating the second installment of Harry, Mrs. Murphy, and Tee Tucker's (mis)adventures in lovely Crozet. Or is it lovely when people keep turning up murdered?!? There's pretty much the same cast of characters as in the first book, with a couple of additions (gotta keep it fresh), and the characters you have already met, you get to learn more about. Standard. I enjoyed the second book as much or more than the first, th Now that I know where the "cozy mystery" section is, I had a much easier time locating the second installment of Harry, Mrs. Murphy, and Tee Tucker's (mis)adventures in lovely Crozet. Or is it lovely when people keep turning up murdered?!? There's pretty much the same cast of characters as in the first book, with a couple of additions (gotta keep it fresh), and the characters you have already met, you get to learn more about. Standard. I enjoyed the second book as much or more than the first, though I may be slightly biased because I live so close to the book's setting. With character names such as "Cabell Hall", which is actually a building on UVA campus, and other mentions of places around town, it's hard to not enjoy. Great books to read in between larger more in-depth novels - I intend to just keep on reading them all. Snuggle up and get cozy.. and prepare for MURDER. Always enjoy these books more for the animals part than the human. Second book in series and the characters are coming along nicely. Rita Mae Brown keeps you on your toes. I love the connection Harry has with her pets. And the gross murders were hard to solve. It took me almost to the end to realize who the murderer was. I am hooked on this series. I thoroughly enjoyed this cozy mystery. It was in some ways just another provincial American town with murders and romance and fluffiness sort of a book that usually irritate me, and it had some of the flaws of that genre (being very middle-class and aspiring-rich oriented in terms of character and somewhat romantic-consumerist) but the animal factor actually added interest and piquancy. 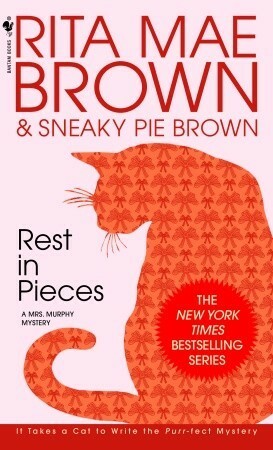 Even though I did not find all of Mrs Murphy's antics entirely believable (she loves being raced around in a m I thoroughly enjoyed this cozy mystery. It was in some ways just another provincial American town with murders and romance and fluffiness sort of a book that usually irritate me, and it had some of the flaws of that genre (being very middle-class and aspiring-rich oriented in terms of character and somewhat romantic-consumerist) but the animal factor actually added interest and piquancy. Even though I did not find all of Mrs Murphy's antics entirely believable (she loves being raced around in a mail trolley and is friends with a possum) I love it when she swore at the oblivious Harry and the way she added smart-arse advice to both Harry and Blair constantly which they occasionally sort of understood by osmosis. I loved that the animals were completely necessary to most of the plot twists and you could argue that Mrs Murphy and Tucker are more protagonists than Harry, Susan or Blair (or any human). If we transfer the idea of the Bechdel test to the animal kingdom, there were named animal characters having conversations about things other than humans all the time (though Mrs Murphy does like to look after Harry, as the book's main author Sneaky-pie Brown - a cat- maintains pets ought to). The foreword by Sneaky-pie himself is GENIUS. So so enjoyable to think that he knew cats would read his work but is surprised that humans do, or that his human co-author might be jealous of his success when she is the one writing serious works. Things I liked less were the shifting POV, the classist and occasionally racist opinions of some of the characters, just how much a bunch of shallow rich people were portrayed as basically "good" ignoring the effects on others of their way of like (I do realise this is pretty standard for the early 90s) and I found the romantic interest in Blair faintly irritating, especially when the unnecessary Fair and Boom-Boom factor was added in (Boom-Boom was most unsatisfactory as a character from a feminist perspective). Considering I usually find heterosexual romances in books nauseating (because the men are portrayed as domineering mainly) this one managed to be relatively acceptable and Harry kept her dignity and independence which I liked. The mystery itself was fair, interesting and with enough twists and red-herrings but not anything that I saw as cheating (I sort of guessed it...but there was enough there for it not to be transparent to me and to be fair I have been reading adult mystery books since I was about 7). There was some action but it fit the plot well and male, female and even non-human characters all behaved intelligently and strongly within it. In short it was the best animal-featuring mystery I have read so far (about my third I think). I'm impressed! I didn't see the whodunnit coming at all on this one. Looking back, I can see hints, but I didn't catch them at the time. I really enjoy the animals in this series a lot. I'll be back for them (and, truth be told, the human interactions, too). Ms. Brown writes fun stories. Bei „Ruhe in Fetzen“ Der Herbst hält Einzug im beschaulichen Crozet und mit ihm auch ein neuer Nachbar: der Schauspieler und Model Blair Bainbridge. Die Damen von Crozet sind verzückt, denn nicht nur, dass Blair ziemlich gutaussehend ist, er scheint auch noch dazu ziemlich freundlich zu sein. “Harry”, the town’s (female) postmistress and a farmer, has a dog, Tucker, and a cat, Mrs. Murphy. The pets talk to each other and other animals in this series (and help solve mysteries). In this one, shortly after an attractive man buys the neighbouring farm to Harry’s, a (non-local) man is found, murdered and in pieces. The animals are lovely, the plot is decent. It is also the most stressful cozy book, oppressive from beginning to the end, as consider every single human characters are superficial, vapid, narcissistic, judgemental, and incredibly fake. Especially the protagonist, the book would be 40 pages long if it's not for all her internal monologues of putting down anyone who dare to deviate to the only perfection, Mary Minor Maristeen the Ideal Human. Also she kept on feeding cats, dogs, and possums choco The animals are lovely, the plot is decent. This book was both quite good and quite bad. First the good: The characters were quirky enough to be interesting, but not so quirky that they turned into cartoon. The writing was solid, the pacing was good, and the mystery was intriguing. As a stand-alone book, this book would have been fine. Then the bad: This book follows almost exactly the plot of Book 1, from the creepy, anonymous postcards, to Little Marilyn's bad choice for a life-mate. The plot was so close, I forgot which book I was readi This book was both quite good and quite bad. Then the bad: This book follows almost exactly the plot of Book 1, from the creepy, anonymous postcards, to Little Marilyn's bad choice for a life-mate. The plot was so close, I forgot which book I was reading at times. I enjoyed this book so much that I stayed up most of the night to finish it. I just discovered the series about a month ago and was hooked after the first book. 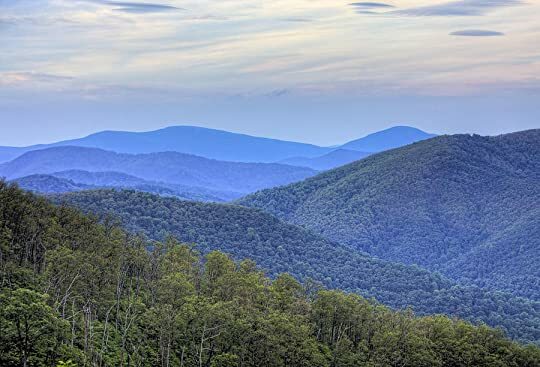 I enjoy reading about Crozet and each of the characters. This one kept me on my toes. I could not figure out who did it until the last twenty pages or so, and then there was a surprise twist that I did not see coming. I look forward to reading my way through the series. I thought the story in the first book was better. The writing in this book was better. The animals seemed to act more like animals in this one, but still didn't seem ridiculous. If that makes sense. 23 more to go. I figure I will listen to them all. It's just a matter of time. These books are fun to read if you don't mind stretching your beliefs a bit to include crime solving animals. I read this series some years ago, and Brown is going to get better in character development, but they are still a nice way to kill an afternoon when it is too cold to go outside! As far as they mystery goes, the murderer had to be one of two people. So, not much suspense there. But the story was a lot of fun. I wish the whole book was told from Mrs.Murphy's point of view, she is so funny. Rest in Pieces was very interesting from start to finish. The mystery was good and the way the characters all interacted with one another was well done. The ending is great, it was unexpected and still felt fresh and new. I look forward to reading the next book in this series. Enjoyable read even though it was a bit confusing at first with the multitude of characters, both human and animal! Before too long though I was hooked and caught up in the tale! Perhaps I needed to read Mrs. Murphy #1 first! Fun book and series. I wish we could use fractions in our ratings because it would be a 3.5 at least. Fun mystery. The animals in it are hilarious. Some unnecessary swearing though. I especially liked the animals antics! Some truly funny things they did made me laugh out loud! I also liked this story better than the 1st 1 in the series! Hard getting used to all the animals but eventually it jelled into an ok read. Could not put it down!!! Wonderfully written characters!! Better than the first one I think!